Environmental Risks: What, Where & When? It provides at-a-glance risk assessments & scenarios plus real time monitoring using vast datasets; reach out now! Editor’s note: Hubert no longer works for CWR on the water & energy space, which included driving the water risk valuation conversation for the energy sector. Engagement with multiple stakeholders at CWR has led him to explore for-profit solutions in addressing challenges in Environmental Risk Analysis. 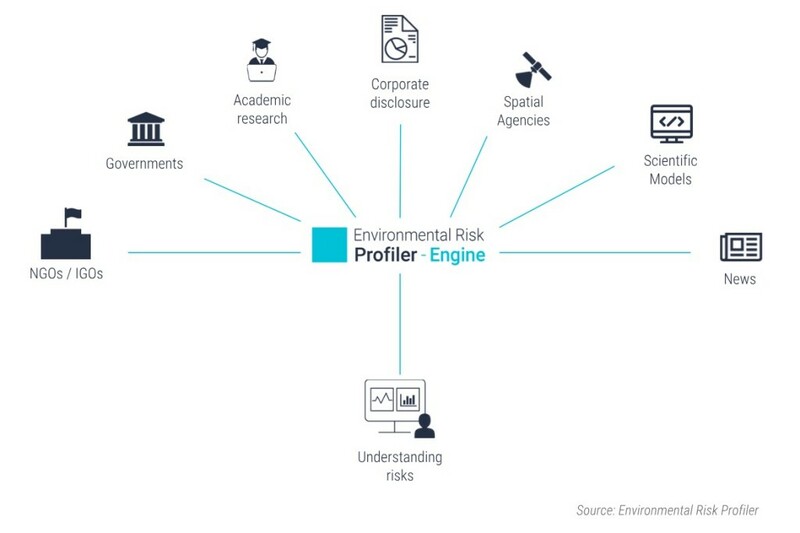 He now spearheads Environmental Risk Profiler, an independent online solution to identify, monitor & anticipate environmental risks, with which CWR may work on a project basis. Find out more about what Hubert is doing with the profiler below. Long delegated to insurers, environmental risks are becoming a mainstream concern for financial institutions and corporates themselves. Whether motivated by regulations, uncertain climate, or simply in a bid to optimise operations and returns, a growing number of organisations are willing to better understand their exposure to environmental risks. However, such analyses can prove challenging as the required datasets and tools are often complex, scattered and irregularly updated. 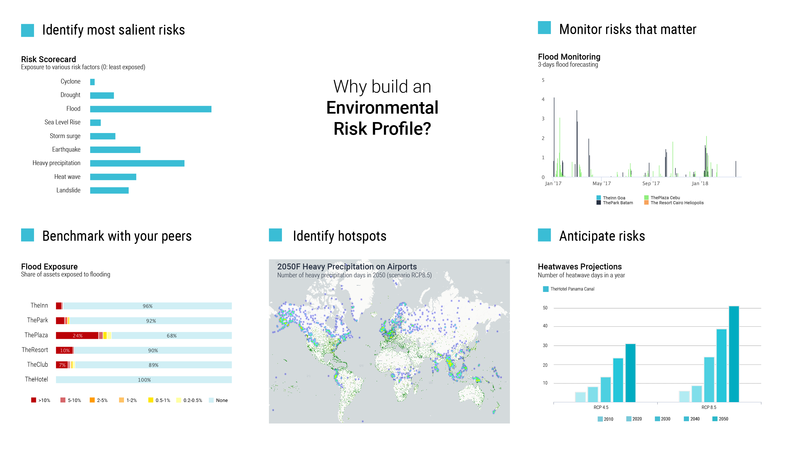 Hence the Environmental Risk Profiler, aiming to make it simple for organisations to get on top of the “what, where and when” of environmental risks. With USD330bn in losses from natural catastrophes and less than half of the losses insured, the year 2017 set a record (second only to 2011 when Japan was hit by the tsunami). And the situation is expected to get worse due to the rising intensity of extreme weather events. 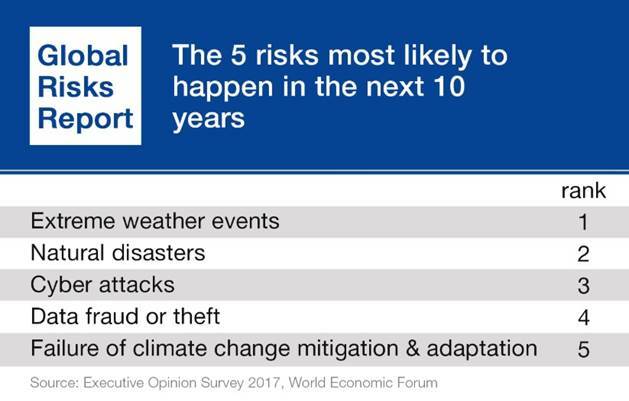 As a matter of fact, extreme weather events tops the 2018 list of most pressing risks published by the World Economic Forum. 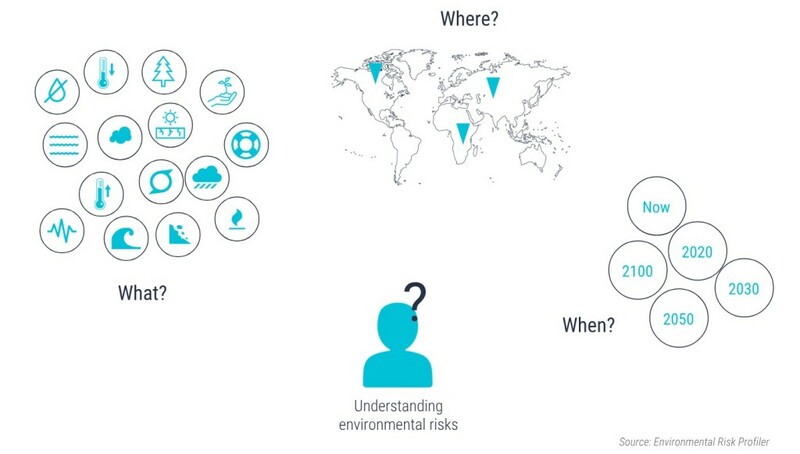 Including natural disasters and “failure of climate change mitigation & adaptation”, environmental risks represent three of the top five risks in terms of likelihood. Add to this a growing set of regulations requiring funds & corporates to analyse and disclose their exposure to climate change – see here for an analysis of environmental disclosure trends in China, and here for the new Natural Capital Coalition supplement named “Connecting Finance and Natural Capital”. As a consequence, more and more organisations are willing to assess their exposure and devise mitigation strategies. The responsibility to care for environmental risks no longer lies on (re-)insurers’ shoulders only. Not all risk factors are equal, nor are companies exposed to the same extent. Understanding one’s exposure to such risks starts with understanding what hazards create the most salient risk for a company, where they are the most likely to materialise, and when they might hit. Take a power utility as an example: which of its power plants are more exposed to heat-waves or droughts, now and in 20 years time? For an airport operator, how does the future look in terms of heavy precipitation, storms, or high temperatures, and how will it impact costs and delays? As a retailer or electronics company, how many of my critical suppliers are exposed to floods? As an F&B actor, is a drought developing where my crops producers are? Hotels, how do natural disasters affect occupancy rate and property values? The list could go on. …e.g. for power utilities, which of its power plants are more exposed to heat-waves or droughts, now & in 20 years time? 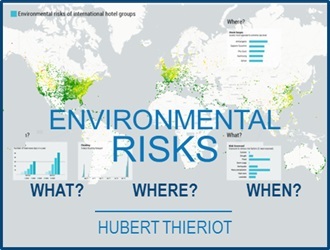 The Environmental Risk Profiler is precisely an attempt to help organisations understand the complexity of these risks in a layman-accessible yet accurate manner, leveraging the most recent developments in terms of data acquisition, modelling and analysis. Visit our website www.erprofiler.com for more case studies and examples of Environmental Risk Profiles. We are progressively drifting from a shortage of data toward a deluge of data, bringing challenges of its own. Think of satellite imagery, drones, climate change models, government open data, NGOs or academics research. Some initiatives have emerged trying to make sense from this plethora of information and make it closer to end-users and decision-makers – see for instance Resource Watch led by the World Resources Institute. 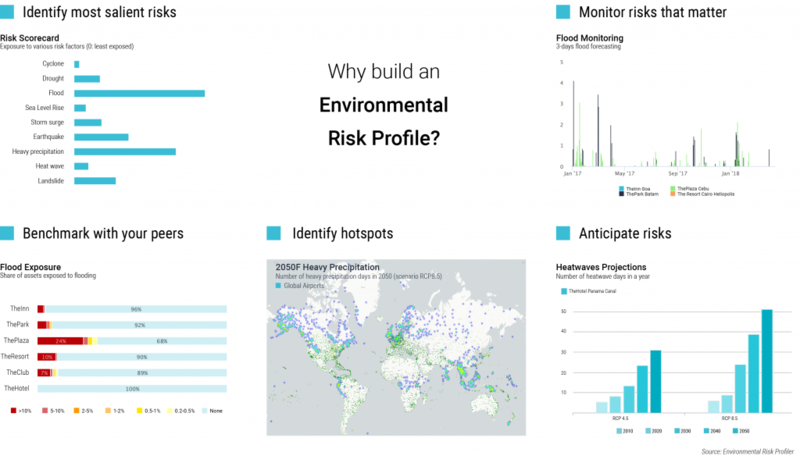 Similarly, the Environmental Risk Profiler draws from the most recent developments of spatial agencies, academics, NGOs, governments and other various sources to provide risk assessments in a accurate, granular and cost-efficient manner. First, get an idea of what companies or portfolios are most exposed to, and how they compare against peers. This is called an environmental risk profile: an at-a-glance identification of the most salient factors both as a company and for each asset individually. Such information will help prioritise risk management strategies. After the most salient risks have been identified, with their locations and time horizons, there are several ways to move forward. The profiler can help set up real-time monitoring (i.e. through satellite data or dedicated information network) to sharpen reaction capacity. Scenarios can be developed with different likelihoods and time horizons to inform risk mitigation strategies and foster resilience in the longer term. Overall, the goal is to help understand exposure to environmental risks and better inform development strategy in the short and longer term. Learn more about the Environmental Risk Profiler here.